Other than one comment from a slightly ticked Morriss—because I used the word viral 10 times—my last post about YouTube Fred didn't get any real dialogue going. Perhaps its because no one really saw the potential of hiring a goofy Internet star to represent their credit union. Fair enough. But before I move on to another topic, I wanted to further explore this new trend of employing self-made YouTube celebrities as product pitchmen. Enter the Alka-Seltzer Great American Road Trip starring Internet sensations Rhett and Link. Let's put my fascination with social media and weird Internet memes aside for a moment and look at the smart marketing strategy at work in this example. Alka Seltzer is a tired old brand that Bayer Healthcare is looking to reinvent and introduce to a new generation. Credit unions find themselves in this same situation. At the core of the Great American Road Trip is a very simple concept. Alka Seltzer is ideal for calming the type of upset stomach that one might get from over indulging in rich, deep-fried road-trip cuisine. 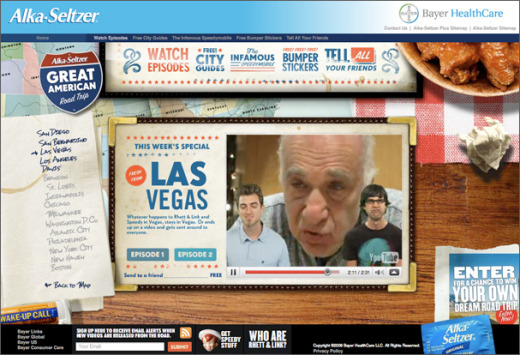 To prove the point, Bayer has hired two proven Internet stars to document their road trip across America this summer. In the process, Rhett and Link are raising brand awareness for Alka Seltzer and likely selling some product along the way. I hadn't thought of Alka Seltzer in years. Now, I can't get enough of this site. Who knows, maybe I'll even buy some Alka Seltzer if I get a stomach ache this summer! This particular video is my favorite. I'll get off this YouTube celebrity track for awhile and move onto something else.